Kit preview of Starcrafts' 1/1400 Enterprise-A . Detail: 8 - Good detail, no real rework required. Should make for easy painting and masking. Accuracy: 8 - Looks good by the reference materials I have. 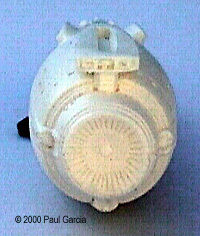 MSRP: $30.00, available from Link and Pin Hobbies and others. Overall Rating: 8.5 - Good value at a reasonable price. 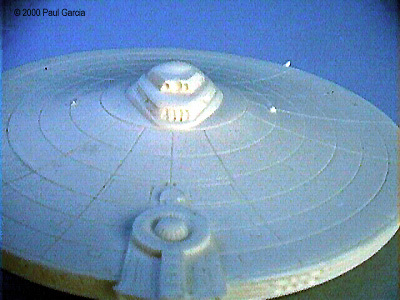 My interest in Star Trek spacecraft has only begun to take off in the last year. I've always liked the models, but have been somewhat put off by inconsistent scales used by manufacturers over the years. And then I saw Jim James's 1/2500th 6-ship diorama at CultTVman's. Between those pictures, and the availability of Clark Bradshaw's decals at the Starship Modelers site, I couldn't resist. Overall I'm pretty happy with the way the TOS and A Enterprises came out, but the size and soft detail really didn't allow for much detailing. 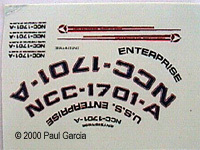 What I really wanted was a whole set of Enterprises in 1/1400th. 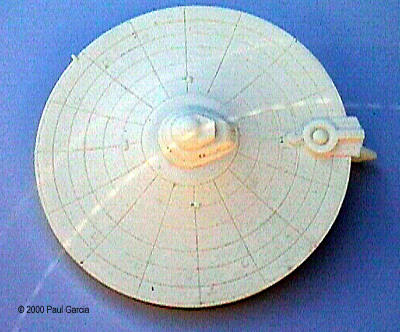 About 3 months ago, I came across a resin 1/1400th Enterprise A while surfing the web. I had never heard of Starcrafts, so I posted a couple of messages asking if anyone had seen this model. After receiving nothing but positive responses, I called Link and Pin hobbies to place an order. They were out of stock, but expected a shipment later that week, so I went ahead and ordered. 10 days later, it was waiting on the doorstep when I got home. 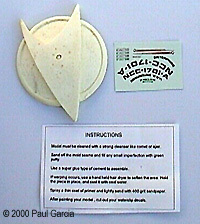 The kit consists of 5 resin pieces, decals, and an assembly tip sheet. 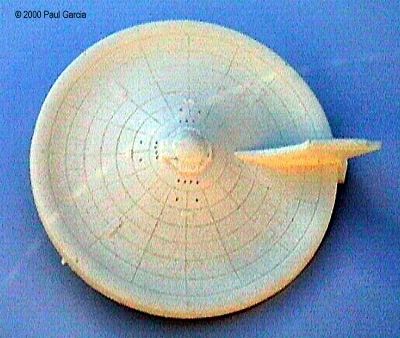 Four of the pieces make up the Enterprise, with the 5th being a simple base. The casting was pretty good overall, with a few pin holes here and there. 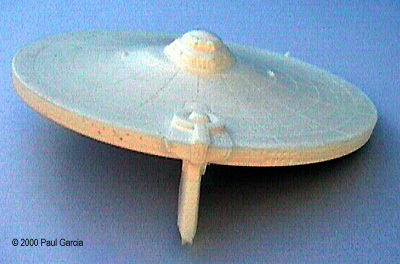 Unfortunately, the example I received had a couple of bubbles that overlapped some of the window detail on the lower primary saucer. A quick phone call to Starcrafts, and couple of weeks later, replacement parts arrived in the mail. I don't recall ever having such a painless encounter with a manufacturer. Now that's service! The mold lines are there, but reasonably well placed so that sanding and filling shouldn't be too tough of a job. The 4 parts that make up the Enterprise are well engineered, and should leave no questions in anyone's mind about how they go together. The pylon to secondary joints are all self aligning, and should require little more than glue squeeze-out to fill the gap. 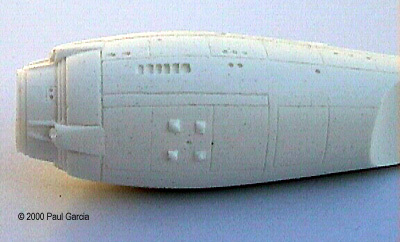 The primary to secondary hull joint might need just a bit of putty. Looking though my various references, I'd say the detail is pretty darn good. 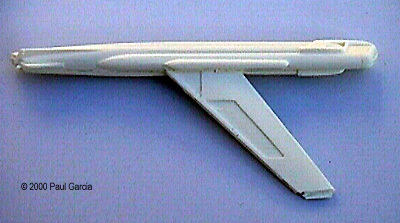 The model scales out to within .030" of the dimensions listed in "Mr. Scott's guide to the Enterprise", with the exception of the secondary hull, which is a about .250" too short. 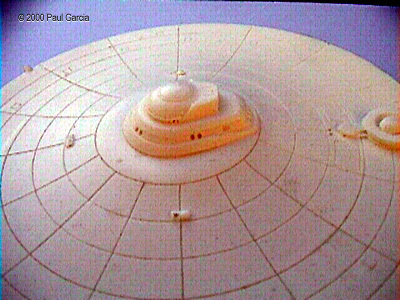 However, it looks to be proportionally correct when compared to the drawings in the same book. The grid lines are even and pretty consistent on both hulls, with some minor wobbles(?) 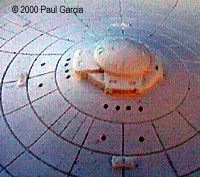 near the rim of the saucer. The surface finish of the Starfleet emblem base is a little rough, but since I was going to make this part of a "series" of Enterprises, I'll be making my own base anyway. The instructions are more of a tip sheet pertaining to the assembly of resin components, but as I've indicated, with only 4 self-aligning parts, instructions really aren't necessary. 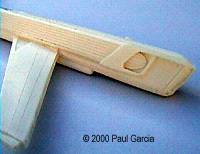 Assembly consists of gluing three joints. I do think I'll probably pin the joints with brass rods to prevent any possibility of drooping. (Note: This is a question of resin vs. size of the components, not a condition specific to this kit). There is no painting guide provided. 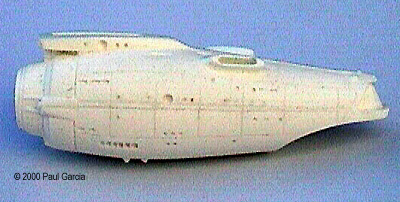 However, the best reference materials I have, were found online at Starship Modeler. I think painting is where this model will really stand out; it's large enough, and detailed enough to merit all the attention you care to lavish on it. Like many of you, I don't have much free time. So when I evaluate a kit, I consider how much time would it cost me to research, plan and subsequently scratch build the same thing. Balance that against how much work the kit will take along with the price. Good value combined with good customer service make this $30.00 kit a real winner. Many thanks to Paul's wallet for providing the review sample. Manufacturers and retailers, interested in getting your wares reviewed and publicized on a site averaging 2000+ readers a day? Contact us!